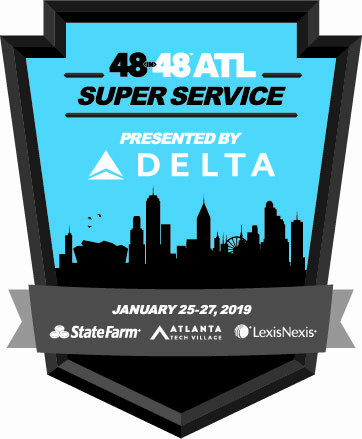 ATLANTA, January 18, 2019 – 48in48 kicks off 2019 with the first annual 48in48 Super Service event presented by Delta Air Lines. The signature 48-hour event will mobilize marketing and technology volunteers to serve nonprofits in the Atlanta community by building 48 non-profit websites in 48 hours. The 48in48 Super Service event will take place the weekend prior to the Big Game and will be held at and hosted by Atlanta Tech Village on Jan. 25-27, 2019. Through the event, participating nonprofits will benefit from $25,000 worth of high-quality professional websites and digital marketing tools, all donated by skilled 48in48 marketing and technology volunteers. These tools will empower the non-profits to be more successful in achieving their missions and to nurture valuable relationships with those they serve and those who support their efforts. Individual and team volunteers will provide skilled support to the participating non-profits throughout the 48-hour event. In addition to creating websites, they will provide needed digital marketing support in the form of social media training, blog resources, logos, design services, content writing and learning opportunities. “We believe in improving society through skills based on volunteerism, education and service, and we do it using the heart and talent of marketing and technology professionals,” said Adam Walker, co-founder of 48in48. A few of the 48 non-profits participating in this year’s Super Service event include the Ovie Mughelli Foundation, Atlanta Autism Consortium and Future Foundation. For more information, those interested can visit 48in48.org/SuperService. 48in48 is a 501c3 organization; our mission is to mobilize marketing and technology volunteers to serve nonprofits worldwide. 48in48 signature events empower nonprofit organizations with tools they need to be more successful in achieving their mission by building 48 nonprofit websites in 48 hours. By 2025, 48in48 will simultaneously execute 48 annual signature events in 48 cities worldwide, mobilizing 10,000 volunteers, serving 2,300 nonprofits and achieving $75 million of impact in 48 hours. Visit 48in48.org to get involved.